The Medical Genetics Clinic, established in 1941, is the oldest genetics clinic in the country. The University of Michigan genetics faculty are known nationally and internationally for their work and are committed to providing quality healthcare, conducting research and teaching the next generation of clinicians and researchers. The Medical Genetics Clinic at the University of Michigan sees individuals with a personal and/or family history of a genetic condition(s). Patients may be referred to our clinic by their primary care physician, by a specialist or may initiate their own appointment. Our clinic specializes in diagnosing genetic conditions, providing care, assessing risks and implications for you and your family members, determining testing options and coordinating genetic testing, identifying supportive resources and providing genetic counseling. Individuals are seen in the Medical Genetics Clinic for many different genetic conditions. Some individuals have a genetic condition and want to be followed by a physician who is familiar with their genetic condition. 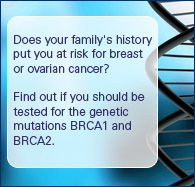 Other individuals have a family history of a genetic condition and want to be evaluated and have their risks assessed. Some individuals are seen for preconception genetic counseling prior to starting a family. There are over 5000 genetic conditions and with research advances, we are learning more about the genetic basis of different conditions. We have included in the “About Genetic Conditions” section web links to some of the more common genetic conditions seen in our clinic. To schedule an appointment, please call (734) 763-2532. The Medical Genetics Clinic is held weekly on Thursday mornings. New patient appointments are typically 1 – 1½ hours. Generally patients are seen within 4-6 weeks, though this may vary depending on physician availability. If you are unable to keep your appointment, it is important that you let us know as soon as possible. Generally, if you are being seen in our clinic for the first time, your appointment will last 1 - 1 1/2 hours. You will be seen by a geneticist (doctor who has specialized training in genetics) and our genetic counselor (master's level health care professional with specialized training in genetics and counseling) may see you as well. As the University of Michigan is a teaching hospital, we may also have genetic counseling and medical students with us in clinic. Geneticists and genetic counselors are board certified by the American Board of Medical Genetics (ABMG) or the American Board of Genetic Counseling (ABGC). To prepare for your visit, we review the family and medical information that you have provided us and construct a pedigree (drawing of your family history information). We review the medical literature, use genetic databases and frequently consult with colleagues across the country. This preparatory work can take several hours and is critical to provide you with the most accurate and up-to-date information. A physical examination will be performed depending on the indication for the clinic visit and type of genetic condition. Most of the clinic visit is spent providing you with information about the genetic condition in understandable terms, discussing your care and linking you with appropriate referrals and resources, including local and national support groups. A letter will be sent to you and your physician summarizing the information that was discussed during your visit.